The PROC VARCLUS statement invokes the procedure. By default, PROC VARCLUS clusters using principal components. As displayed in Output 96.1.1, when there is only one cluster, the cluster component (by default, the first principal component) explains 58.41% of the total variation of the eight variables. The cluster is split because the second eigenvalue is greater than 1 (the default value of the MAXEIGEN option). The two resulting cluster components explain 80.33% of the variation in the original variables. 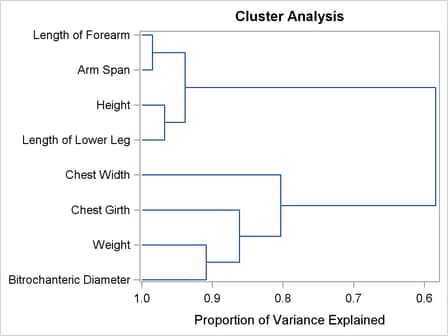 The cluster summary table shows that the variables Height, ArmSpan, Forearm, and LowerLeg have been assigned to the first cluster, and that the variables Weight, BitDiam, Girth, and Width have been assigned to the second cluster. The standardized scoring coefficients in Output 96.1.1 show that each cluster component has similar scores for each of its associated variables. This suggests that the principal cluster component solution should be similar to the centroid cluster component solution, which follows in the next PROC VARCLUS run. The cluster structure table displays high correlations between the variables and their own cluster component. The correlations between the variables and the opposite cluster component are all moderate. The intercluster correlation table shows that the two cluster components have a moderate correlation of 0.44513. Cluster 1 will be split because it has the largest second eigenvalue, 1.770983, which is greater than the MAXEIGEN=1 value. No cluster meets the criterion for splitting. The first cluster component, which in the centroid method is an unweighted sum of the standardized variables, explains 57.89% of the variation in the data. This value is near the maximum possible variance explained, 58.41%, which is attained by the first principal component shown previously in Output 96.1.1. The default behavior in the centroid method is to split any cluster with less than 75% of the total cluster variance explained by the centroid component. Since the centroid component for the one-cluster solution explains only 57.89% of the variation as shown in Output 96.1.2, the variables are split into two clusters. The resulting clusters are the same two clusters created by the principal component method. Recall that this outcome was suggested by the similar standardized scoring coefficients in the principal cluster component solution. In the two-cluster solution, the centroid component of the second cluster explains only 72.75% of the total variation of the cluster. Since this percentage is less than 75%, the second cluster is split. In the R-square table for two clusters, the Width variable has a weaker relation to its cluster than any other variable. In the three-cluster solution this variable is in a cluster of its own. Each cluster component is an unweighted average of the cluster’s standardized variables. Thus, the coefficients for each of the cluster’s associated variables are identical in the centroid cluster component solution. The centroid method stops at the three-cluster solution. The three centroid components account for 86.15% of the variability in the eight variables, and all cluster components account for at least 79.44% of the total variation in the corresponding cluster. Additionally, the smallest squared correlation between the variables and their own cluster component is 0.7482. If the PROPORTION= option were set to a value between 0.5789 (the proportion of variance explained in the one-cluster solution) and 0.7275 (the minimum proportion of variance explained in the two-cluster solution), PROC VARCLUS would stop at the two-cluster solution, and the centroid solution would find the same clusters as the principal components solution, although the cluster components would be slightly different. Cluster 1 will be split because it has the smallest proportion of variation explained, 0.578875, which is less than the PROPORTION=0.75 value. Cluster 2 will be split because it has the smallest proportion of variation explained, 0.7275, which is less than the PROPORTION=0.75 value. The results from PROC VARCLUS are shown in Output 96.1.3. The principal component method first separates the variables into the same two clusters that were created in the first PROC VARCLUS run. In creating the third cluster, the principal component method identifies the variable Width. This is the same variable that is put into its own cluster in the preceding centroid method example. The tree diagram in Output 96.1.4 displays the cluster hierarchy. It appears from the diagram that there are two, or possibly three, clusters present. However, the MAXC=8 option forces PROC VARCLUS to split the clusters until each variable is in its own cluster.